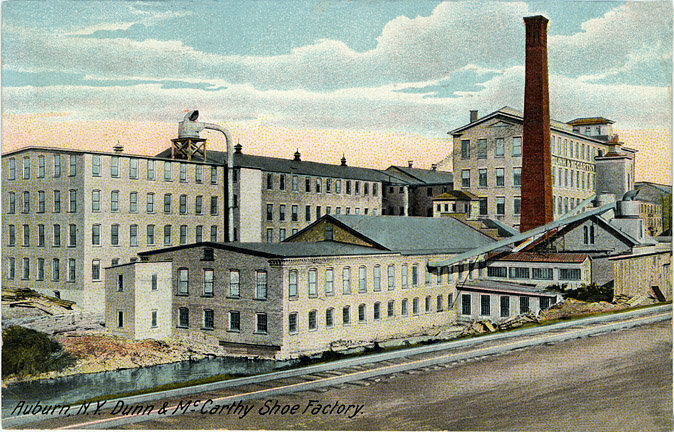 My Mom was a "fancy stitcher" in the shoe factory, Dunn & McCarthy in Auburn, NY for nearly all of her life. She was featured here in the local Citizen Advertiser Newspaper on the last day of her work. July, 1989. She was 78 years old. Mom loved her work, she always said it was her salvation. 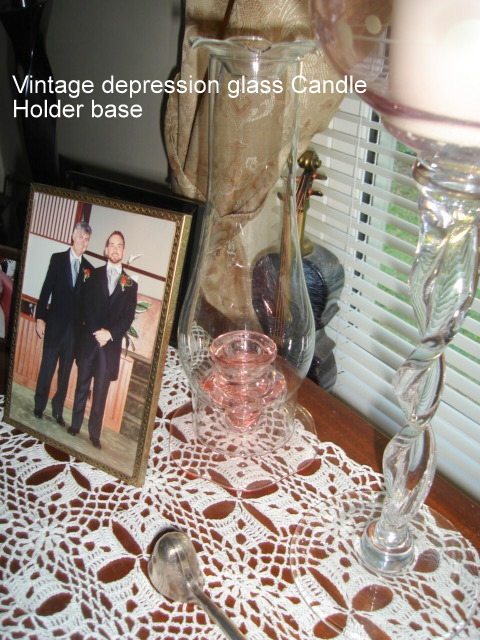 When she was twelve, she lost her Dad in a train/car accident along with her oldest brother. 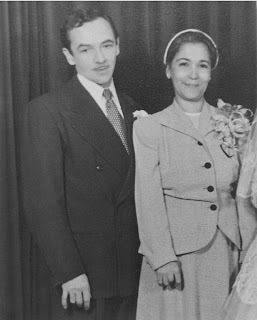 She was allowed to go to school until she was 15 years old and then she was taken out to work in the shoe factory to help support her family. She had wanted to be a teacher. 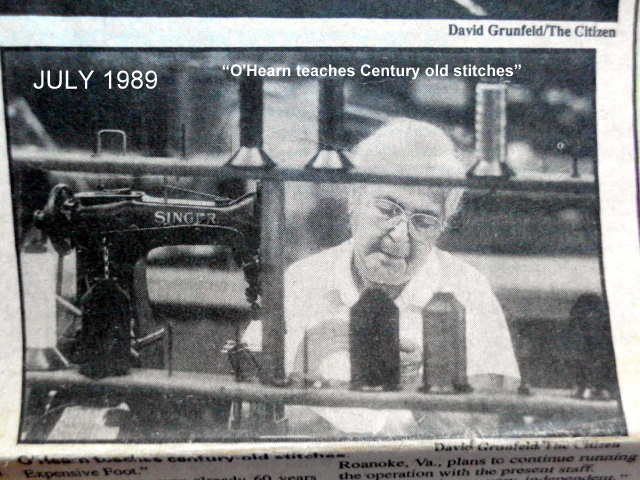 To some extent this was fulfilled in that she taught young people the skill of stitching on shoes that is now a lost art. 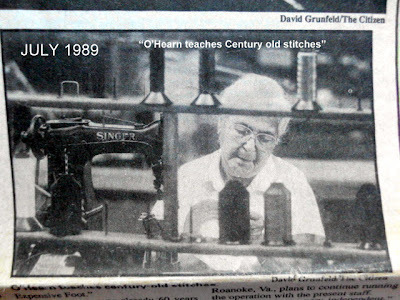 Except for a few short years when she worked at another shoe company, she always worked for Dunn & McCarthy Enna Jettick's Shoe company and retired from there. Mama walked to work every day although it was a good distance from her home. She supported us when we were little as our Dad was an amputee and was not able to work most of his life. 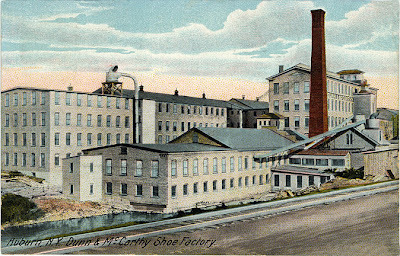 But they did meet in the shoe factory where my Dad also went to work as a very young man to help out his family. My Mom was very highly thought of and respected for her excellent decorative stitches that she sewed on leather and suede. 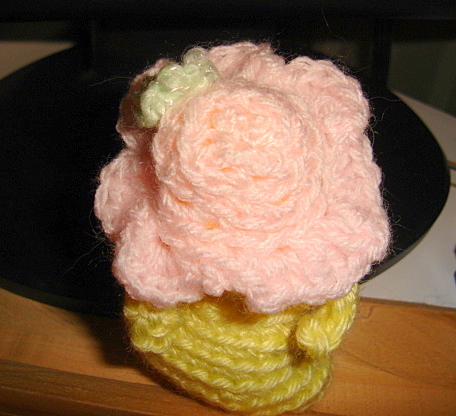 Mom was very crafty and she was always making clothes, toys, etc for us when we were little in addition to her working. She has taught me all my crafting skills of knitting, crochet, sewing, doll making, ad infinitum! She was patient and kind and always smiling. She also did oil paintings and later in life became a China painter doing exquisite work. 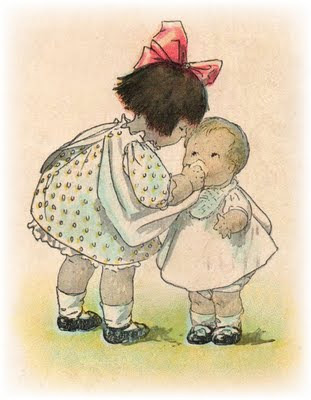 I have several small pieces that she painted and treasure them. I have written my autobiography for my children containing the struggles my Mom endured while raising us and dealing with my father's handicap and drinking problem. She was an absolutely amazing woman and we all loved and miss her dearly. Thank you for letting me share my little Mama with you. She was under five feet tall but a giant of a lady to me! Please visit Kerrie's Home Journal for an inspirational message and a talented video of a 4 yr. old singing and playing. Grandsons are made to catch bugs. Elders were made to scold. Grandparents were made to age with ease. If they are lucky lass and lads! For once having loved someone. Thank you for visiting and come back soon! Check out http://kerrieshomejournal.blogspot.com/ for a spiritual message for today. THIS AUTUMN is truly awesome! I love every minute of every day! 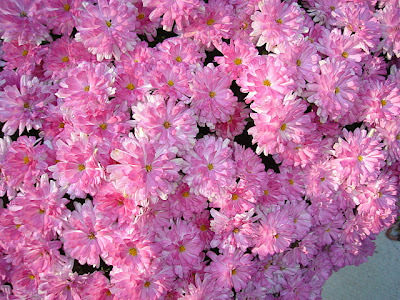 The yard is so full of color and the crisp, put- on- another- blanket nights are wonderful for sleeping!! 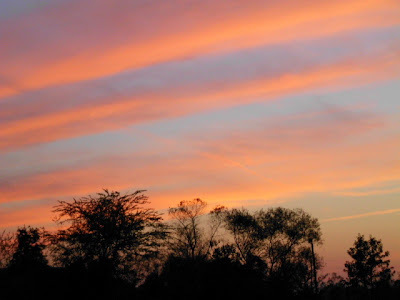 I feel invigorated with the cooler air and a certain restlessness.... It has always been that way. 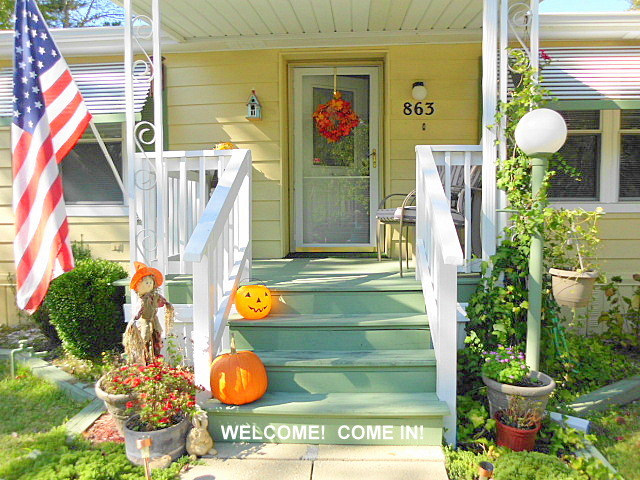 The front porch is welcoming all of you with traditional fall deco. I made the fall wreath for the front door with just fall fabric leaves tucked into a straw wreath. I store it for another year when through. 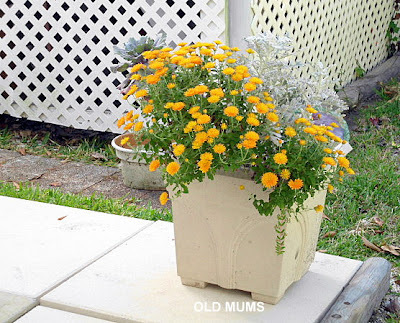 My potted Mums come up every year and though not as full as the first year they were purchased they still add color and cheerfulness to the yard. 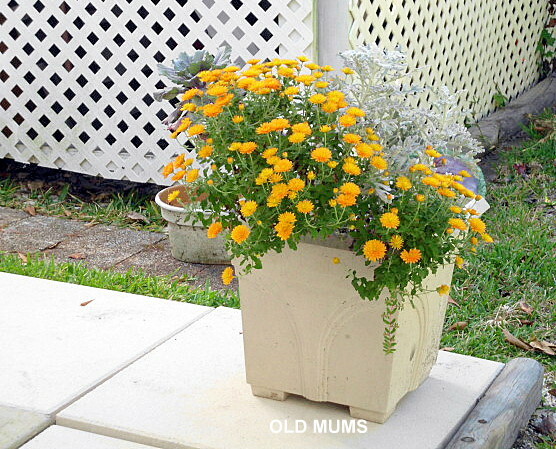 These mums are also old ones and are in the back yard on the patio next to the bicycle shed. I love their color! Even the Pyrocanthus is bright with berries that the birds love! 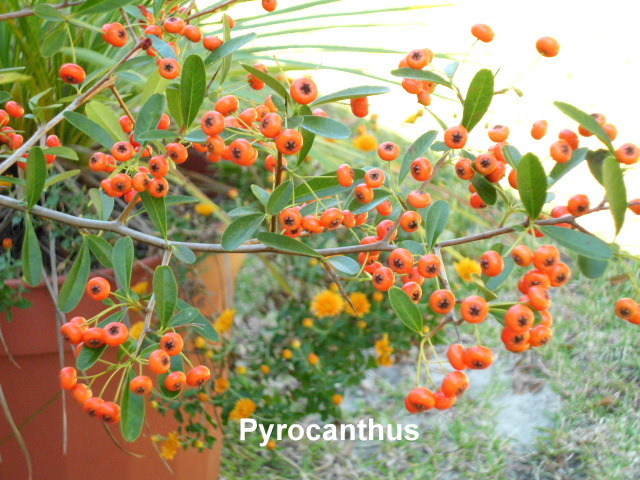 They come and feed off the berries all winter. Mocking birds seem to really love them! And the same is true of the Shamrock plants, they are all blossoming again and the shamrocks are so green! 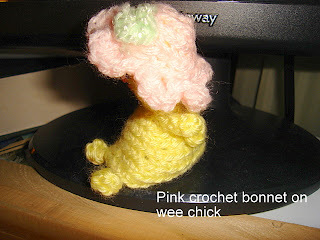 Thanks for visiting and drop in on my craft blog to see some really pretty Pomp-a-doodle yarn and scarf. Do come again soon! Have a wonderful rest of your blessed Sunday! 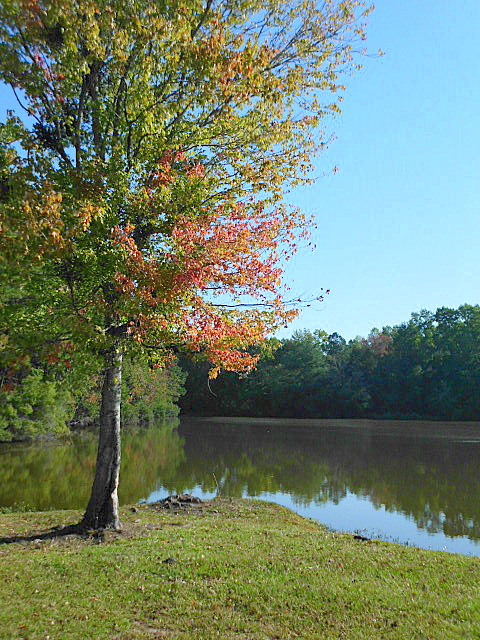 Autumn is such a picturesque time of year! And our three day camping trip to Bass Lake, SC was not a disappointment! The reflection on the lake every morning was like glass! How we love nature in all her glory. The first night's sunset was just so beautiful and brilliant in color! And of course I had to take a picture of the October Moon! I had my new camera with me, the Pink one-ha! 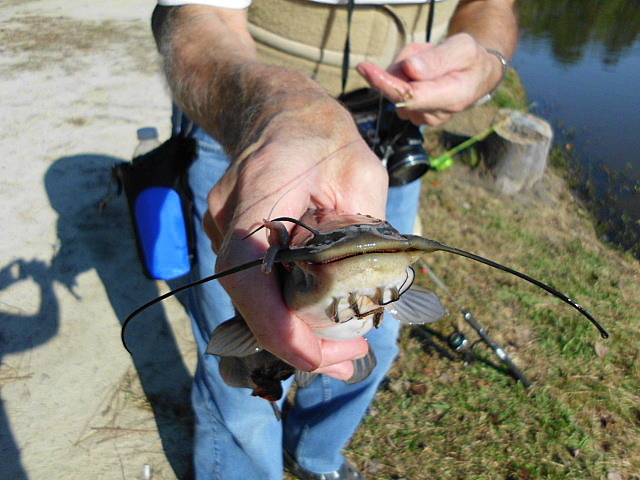 And I am very pleased with the photos that I was able to get. 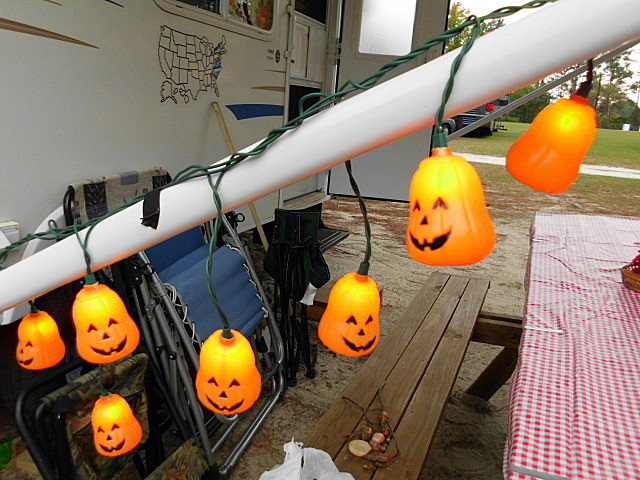 And last but not least, I had to have my pumpkin lites on the camper for the last night there. It was so peaceful and my hubby Bill slept well to the sound of near by train whistles which we both enjoyed immensely. 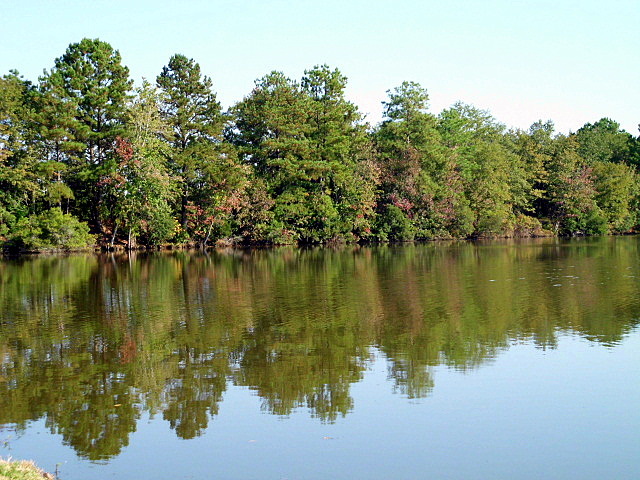 If you want to go to a lovely wild place, stop at Bass Lake Campground in SC. We are definitely going again on Bill's week off of treatment in a few weeks. 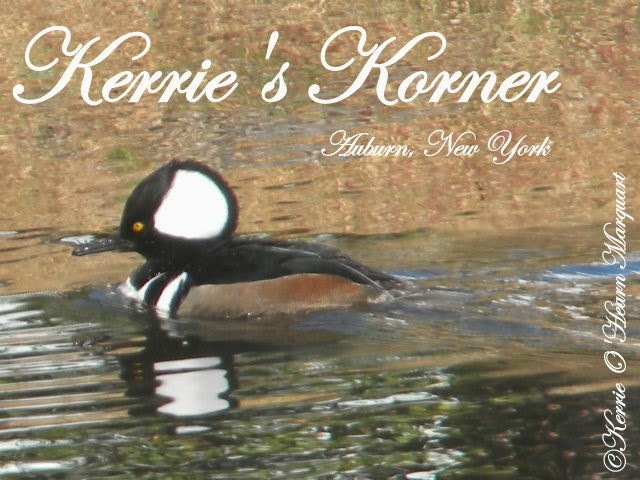 Thank you so much for stopping by my little Korner of the world. I appreciate you all and love your comments!! Come again soon. And goodie, I get to use my Pooky's Grandma Witch cartoon that I created last Halloween! Enjoy! 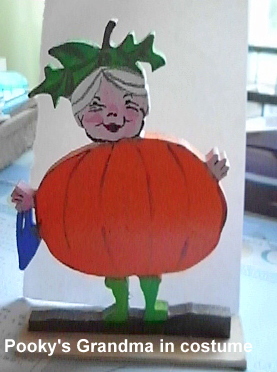 Pooky's Grandma is very outspoken but very sweet and she loves everyone. She is full of wisdom and smiles. ANOTHER WONDERFUL PINK SATURDAY HOSTED BY BEVERLY AT "HOW SWEET THE SOUND". Be sure to visit all the wonderful contributors listed on Beverly's site to experience the ultimate Pink experience. 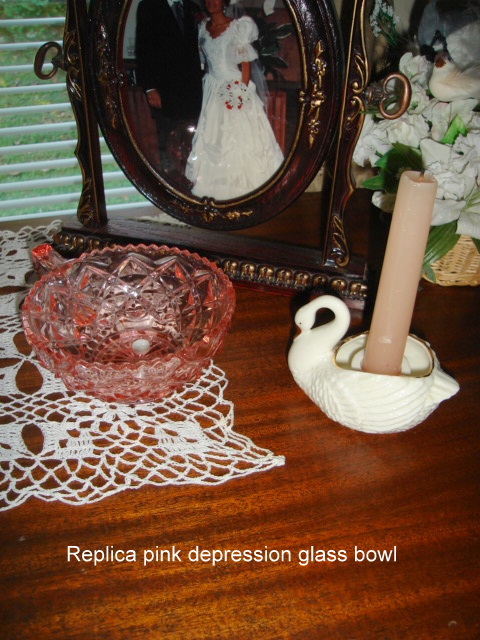 This is Breast Cancer Awareness month so is sure to be special! 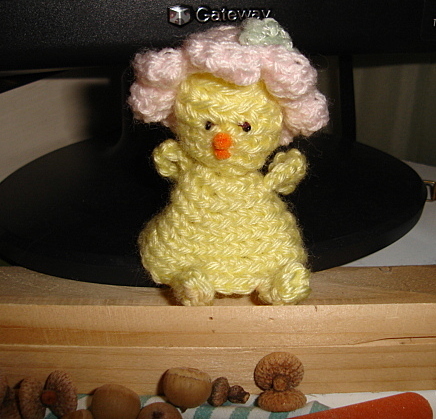 The pattern was for an egg cover but I have it sitting by my computer. 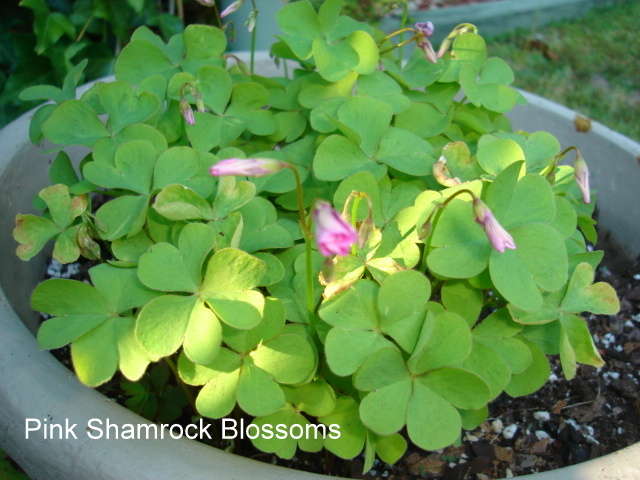 Shamrocks blossom all year and winter over. 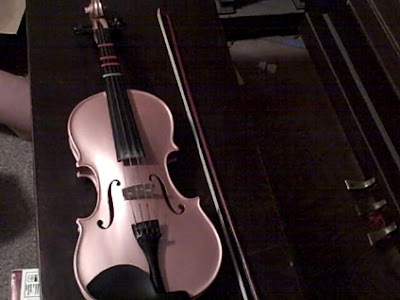 A Young Friend's Pink Violin! My new pink Camera from my daughter! 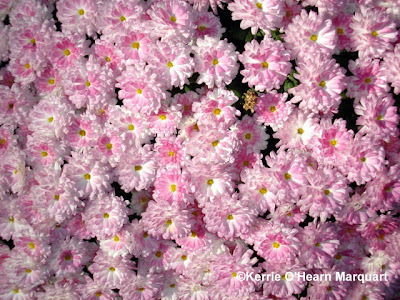 I hope you have enjoyed all the Pink Saturday entries for today! 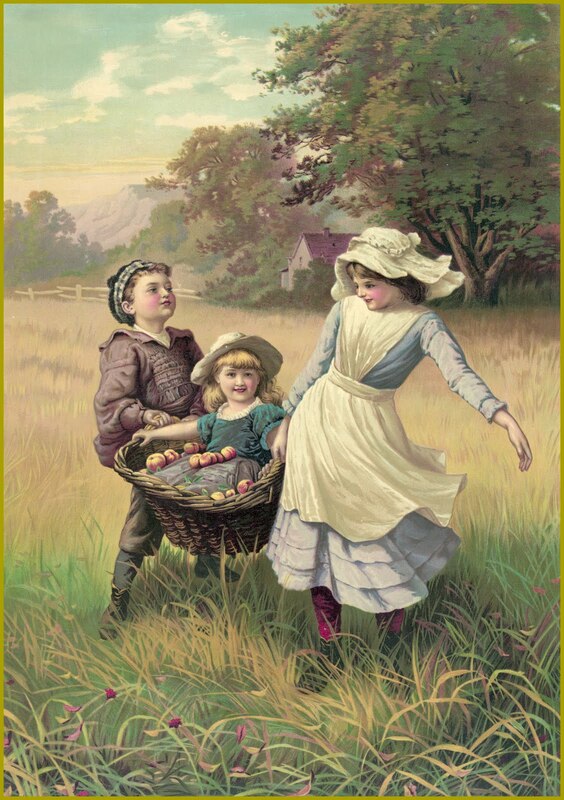 DON'T YOU JUST LOVE THIS PRECIOUS VICTORIAN GREETING CARD?! I thought it was just perfect and too cute for this time of year! Feel free to copy and paste! 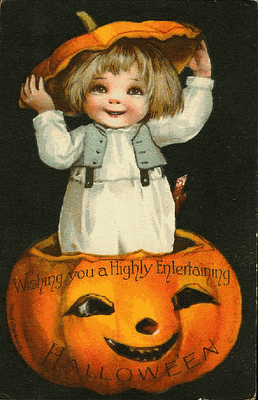 Use for greeting cards or on your blog. 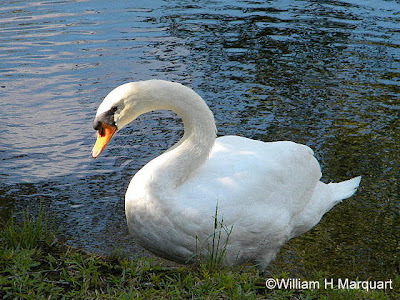 Another glorious day here starting in the 50's and at present it is sunny, 80 degrees and cooling off for the evening. The air was so fresh with all the windows open all day long. And though I got some cleaning and laundry done, I am very lazy-ha! 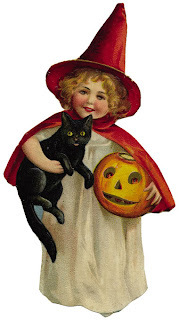 Below is one of my fall poems written for this October. 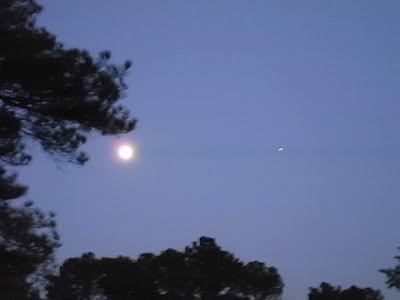 That greet me when I walk. So that fall rain can run free. 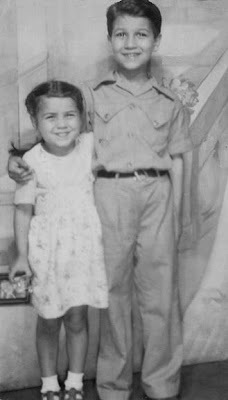 Here is a picture of my brother Joe and me taken in the 1940's at Owasco Lake Park in our hometown of Auburn, NY. Note the military dress of my brother's clothes as was popular at that time. I am five years old in this picture and that would make my brother eight. Joe went on to become a custodian of history in our town and county of Cayuga. He was recently lauded for his historical contributions. He is the author of O'Hearn's Histories, a monthly publication on the history of Auburn and Cayuga County. William H Seward's home is there as well as Harriet Tubman's. His website is http://www.ohearnshistories.com/ His publication is published there monthly also. This basket of faux fruit sits on the corner of my counter all year long. Just to look at it makes me happy! I added the Fall bow for this time of year. I just love old recipes and I have a 1940's "The Lily Wallace New American Cook Book" It was given to one of my sisters back in the 50's and then given to me many years later. The recipes are both basic and complicated, the illustrations wonderful and humorous for in the 40's it gives recipes to be served "with or without servants!!!" Don't think I need to worry about that-ha! Today I have a simple recipe for Apple Crisp in keeping with the season, mmmm! I can smell it now! 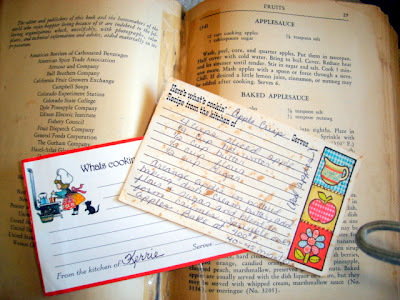 You definitely can tell I have used the old cookbook and this recipe many times in the last 50 yrs! Arrange apples in a buttered baking dish (or you can use spray). pour hot water over them. Cream butter adding flour and sugar to blend and form crumbs. Sprinkle over the apples and bake at 400 degrees for 40-45 minutes. Serve with ice cream or as is, Delicious! Remember that you can use substitutes for sugar (sweetener), margerine for butter, etc. to make this low calorie. It does not change the flavor. For my sweet Love and me. And we still pray for a miracle. Why bad things happen to good men? And we mourn the way we were. For half of me is him, together we are whole. All my faith and joy again reborn. Knowing I can rest in His great hand! APPLE BREAD and Fall Critters! LOVELY FALL, HOW I LOVE YOU! 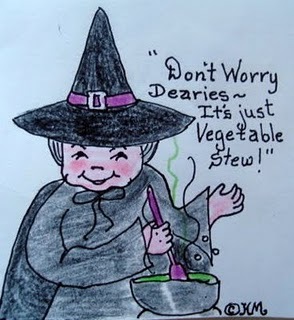 The crispness of the Autumn air, open windows, blankets at night, hot comforting drinks and yummy cooked dinners---Ahhh! 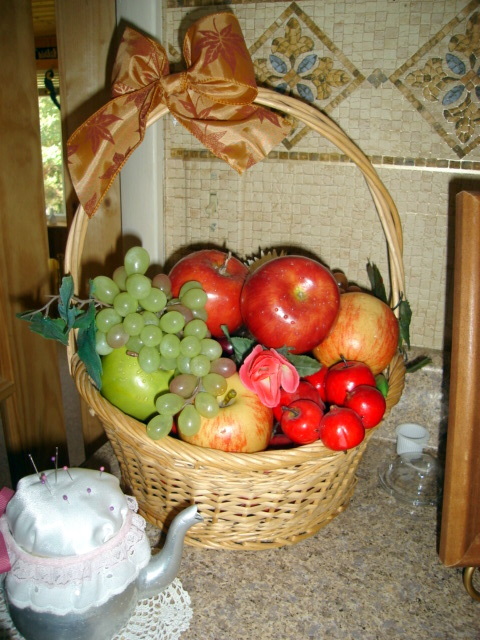 Here is a wonderful recipe for APPLE BREAD from my archives-LOL! I love this recipe because you do NOT peel the apples!! Yes, you read it right. Mix all ingredients well by hand and bake in a greased loaf pan at 350 degrees for 50 min. Test with cake tester or thin knife blade and it is done when blade comes out clean. Delicious with butter on the slices. Makes 1 loaf. 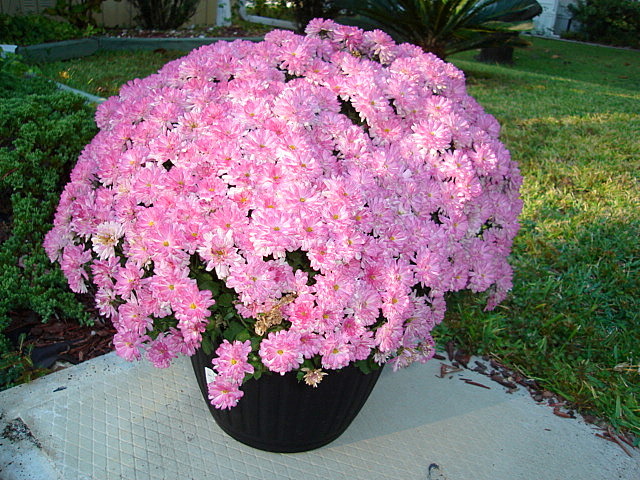 Here is a close up of my lovely pink Mums! I just love them! 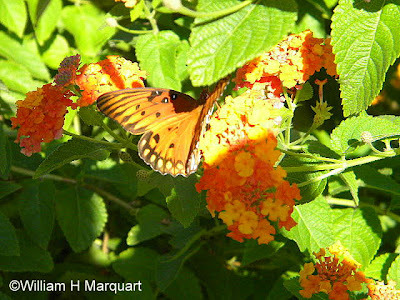 This is a picture Hubby took in the front yard of this butterfly on the Lantana bush. 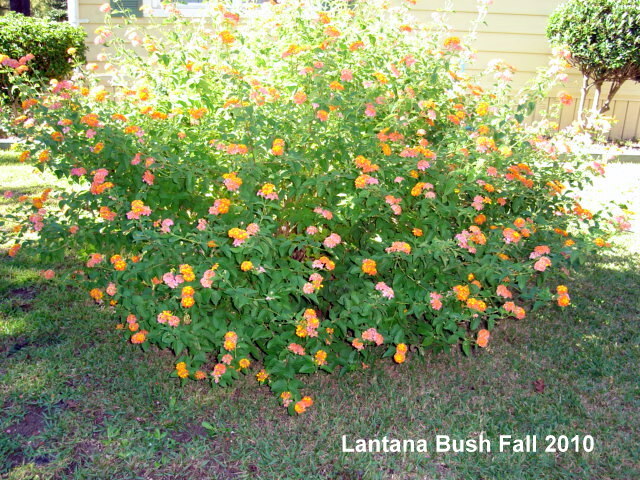 The bush is huge this year, at least 5 1/2 ' high and at least 6' across!! 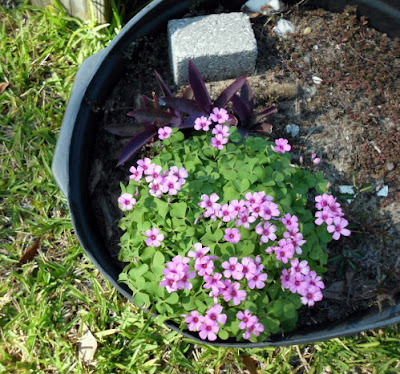 It comes back every year and blooms until we have a frost. When the leaves die, we cut it back to the ground. This is the largest it has ever grown! This particular plant is more than 5 yrs. old and we have moved it twice from the spot in the back yard to another and then eventually to the front yard where it is today. Lantana has proved to be a very hearty and beautiful plant that attracks butterflies by the dozens. 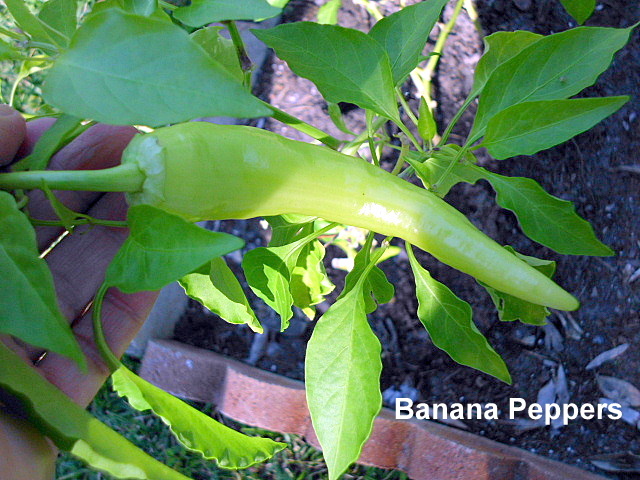 It provides seasons of enjoyment! I hope you enjoyed your visit today and do come again soon.